Home The Adventure Paraguay Welcome to the Supermarket of South America! I was in a bad mood when I reached my hostel in Ciudad del Este. I’d left my external battery on the bus – it bad been invaluable for long journeys and I’d squandered it. There was no one else to blame either – I’d been in a rush to get off and not checked my seat. I really should have put it back in my bag after using it. Disclaimer: This is not the bus I arrived on. Nevertheless, I was pretty sure I would be able to get another battery – the markets being infamous for cheap goods and lots of smuggling. 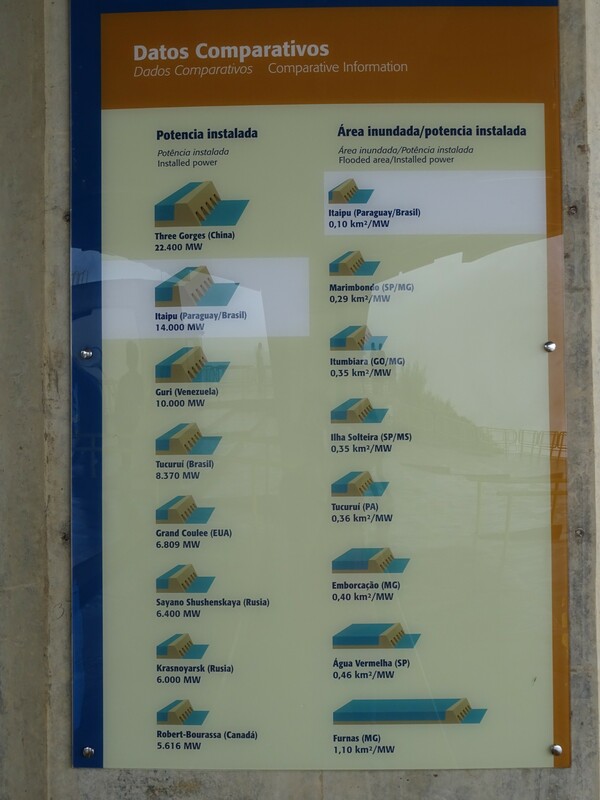 The first place I went though, was Itaipu dam. 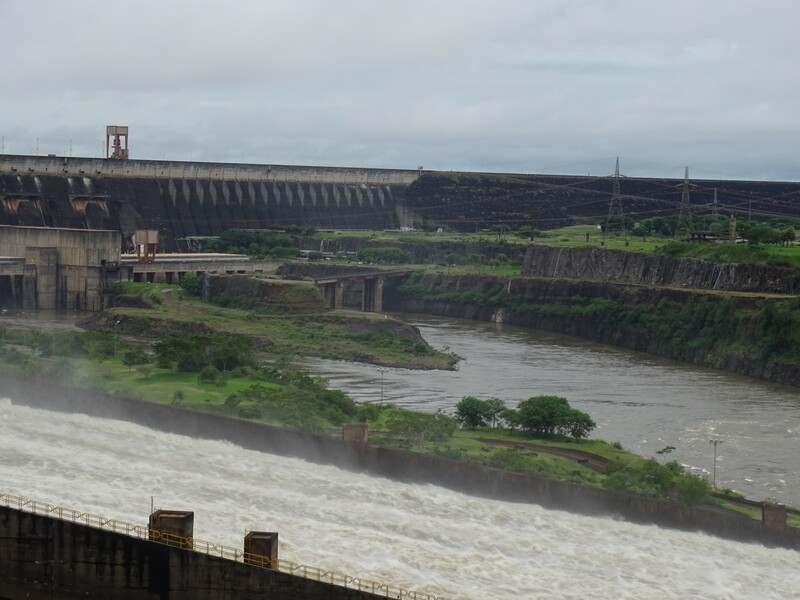 Only the second biggest Hydroelectric dam in the world now, (after China’s humongous Three Gorges dam) it still generates 80% of Paraguay’s electricity and 20% of Brazil’s. 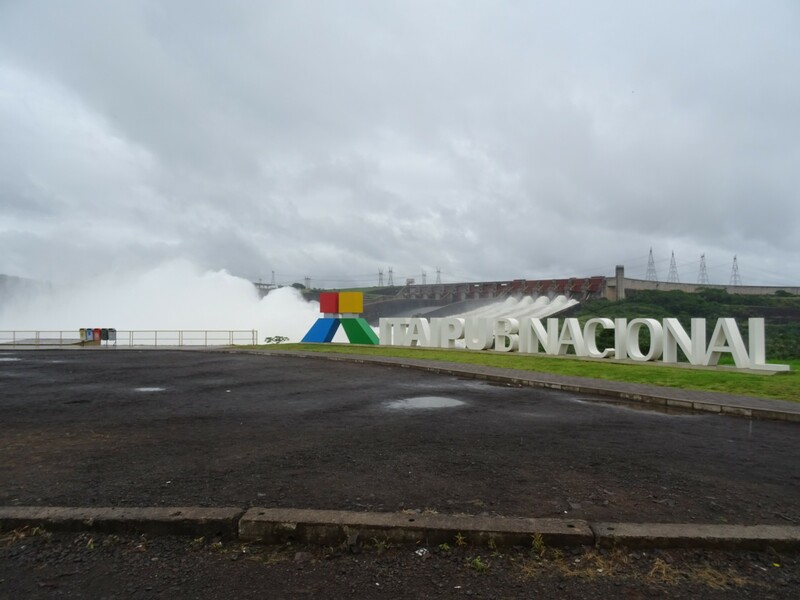 In fact, so proud of it is Paraguay, they run tours to the dam for free. Definitely not for publicity purposes at all. Still, its nice to see them maximising potential. There’s a lot of spray. It’s pretty close to the city, and easy to find the offices, if not the entrance for visitors. A generous lift down the road from a bloke on a motorbike though meant I got there fine. After watching a video full of info and stats about the dam, they piled us onto a bus. 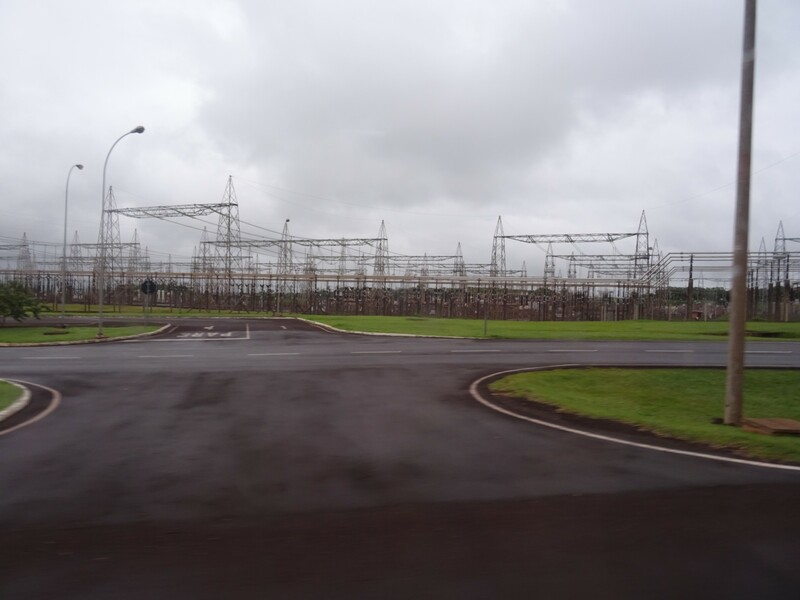 There are lots of pylons here. The dam itself is seriously impressive. The amount of water coming over alone was incredible, but that which it holds back must be huge. While you can certainly question the ethical implications of flooding so much land, destroying habitats, forests and a set of waterfalls supposedly larger than Iguazu (that apparently no white man ever saw – so remote they were), what is not in question is the scale of the achievement. It’s a view of a dam. Two statistics stood out for me in a blaze of Spanish information. 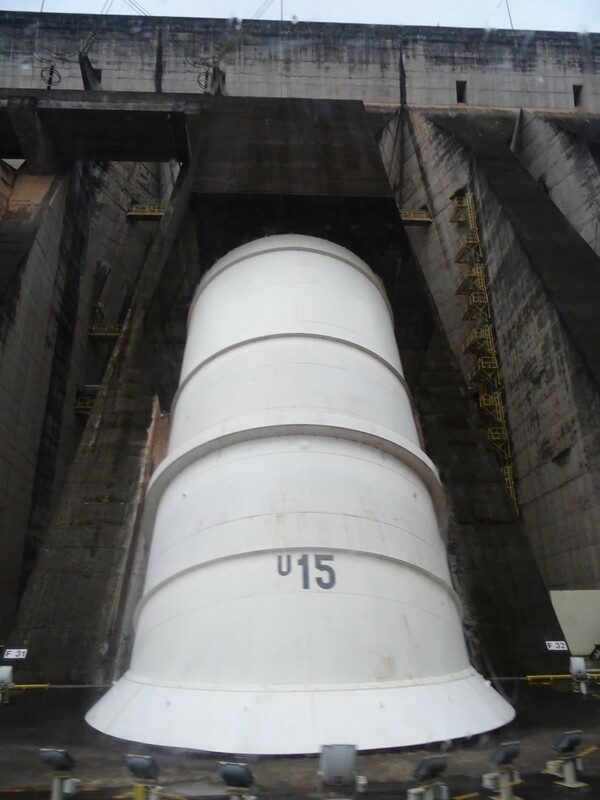 The first – The dam powers fourteen turbines. 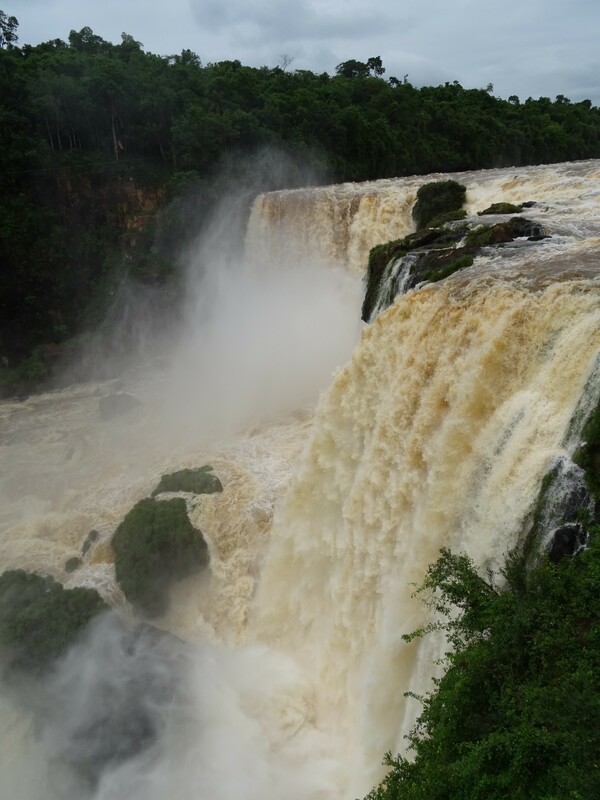 If the power of Iguazu was fully harnessed it would struggle to power two. 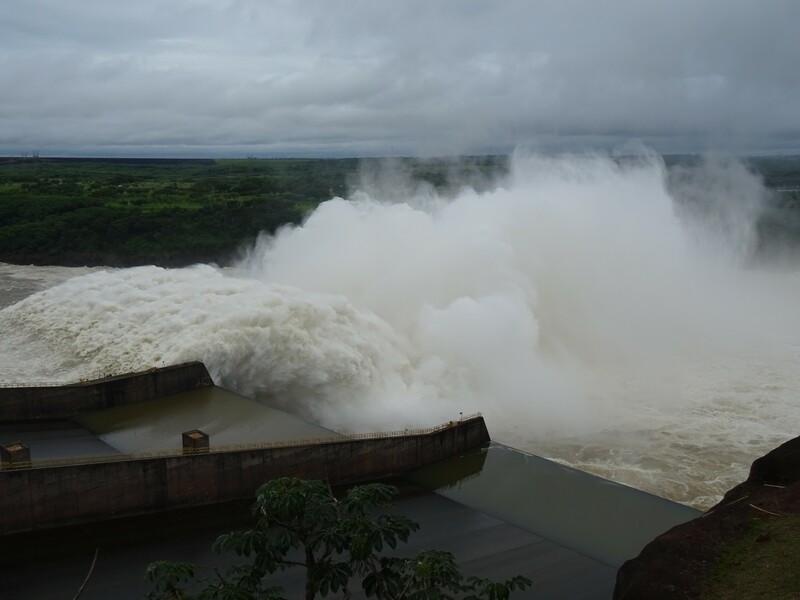 The second stat was that apparently the dam flooded considerably less land than most other hydroelectric dams, especially when comparing the amount of electricity generated. That is a stat worth shouting about. These stats are everywhere. I wonder why. There was only one disappointing thing about the tour. While we drove over, we didn’t get to stand on top of the dam. This is what I had most wanted to do, and while I can see why they don’t let people (someone throwing themself off is NOT good publicity!) I was still a bit gutted. Ah well. I had planned to get a few things done the next day too, but I’d wanted to ask the hostel owner a few questions first, and book another night. Typically, she was out – no one else worked there – and while I assumed she’d be back shortly to, you know, check I’d left, she didn’t return till 2 o’clock. This was actually a common theme in the hostel – she stayed in a locked room all the time to avoid speaking, and when you knocked on the door, she would just like her head out. If she answered at all, that is. Hardly inviting or helpful. It also didn’t stop me receiving a dozen texts, emails and WhatsApp messages demanding to know when I was arriving originally though. A prettier picture of Ciudad del Este. I digress. And waffle. I took the opportunity to go around the markets for the afternoon and buy myself a new battery. I was actually pleased with my bargaining skills for once – the price lowering to 40,000 guaranies from 60,000. I wasn’t pleased with the results though. Upon a thorough later testing it did work, just not very well. I’m pretty sure 5600mah batteries are supposed to charge more than 30% of my phone. 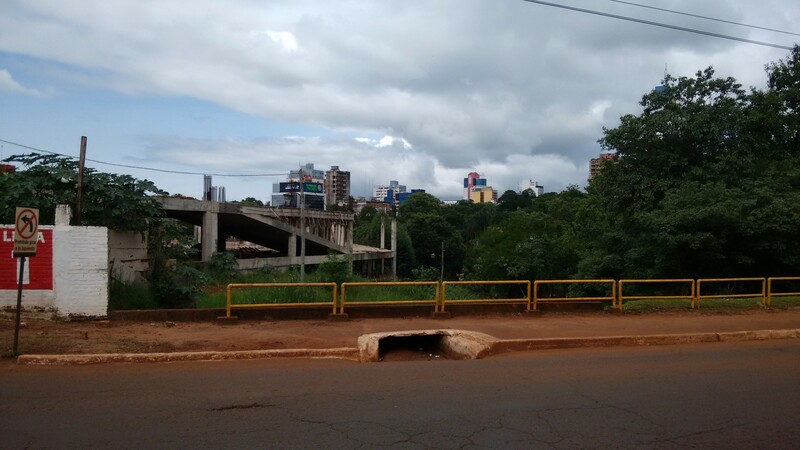 A normal picture of Ciudad del Este. 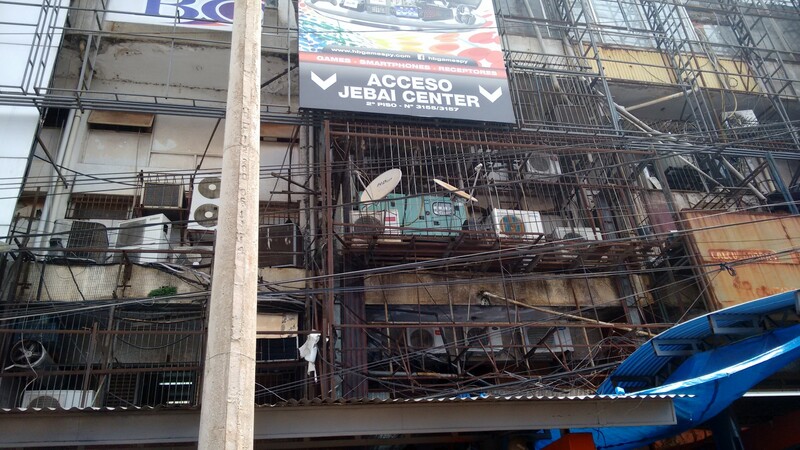 Ciudad del Este doesn’t have much of a centre, if I’m honest. The further you get from the border, the more of feels like you’re heading into outskirts neighbourhoods. The border isn’t exactly picturesque though. 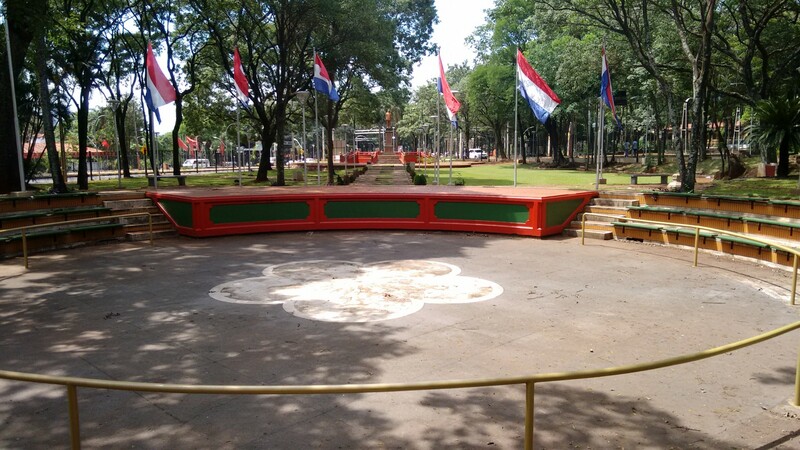 Apart from a few green spots and a faux Japanese park there are no friendly squares like the rest of Paraguay. Although it’s a border town it feels like a lost opportunity. 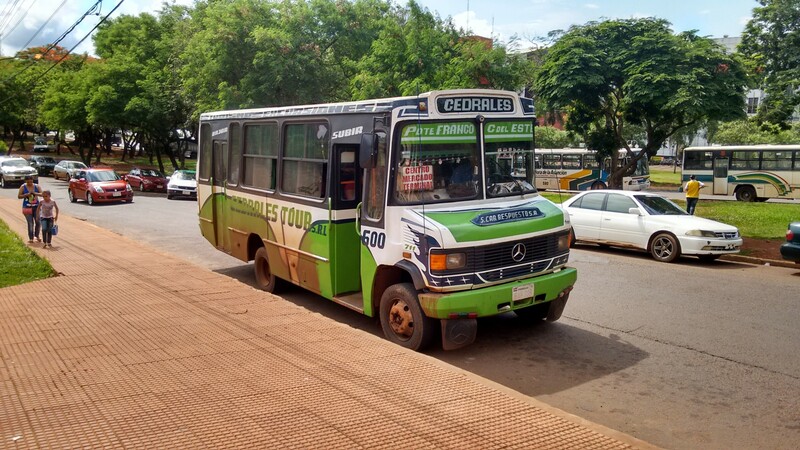 The tourist extravaganza of Foz do Iguazu lies just across the border – brighten it up and Ciudad del Este could really promote more of an industry, and the money it brings. A Japanese style park. For some reason. I headed to Salto del Monday before I left. Overshadowed by Iguazu next door, its an impressive waterfall in its own right, but doesn’t pack the same wow factor of others in South America. It’s a traveller issue I think – while you know some things should be awesome you just can’t feel it. Too much exposure leaves you slightly dulled. It’s just not Kaieteur, is it? Just as I was about to leave for Brazil, I got a surprise message. It was Jimmy. When he’d left Sucre he’d been umming and ahhing about whether to come to Paraguay, maybe at Encarnacion. I’d promptly lost my phone and number though, and while I’d messaged with a new one, I’d neglected to include my name on my message. The usual braniac move. That was two weeks ago. A healthy lunch today. Honest! As luck would have it, he was in Ciudad del Este. He’d only realised the number was me by checking the area code – not too many people message him with Paraguayan numbers. I delayed my border crossing a couple of hours to meet up and catch up. While I’d been working my way round Paraguay he’d been travelling through northern Argentina. 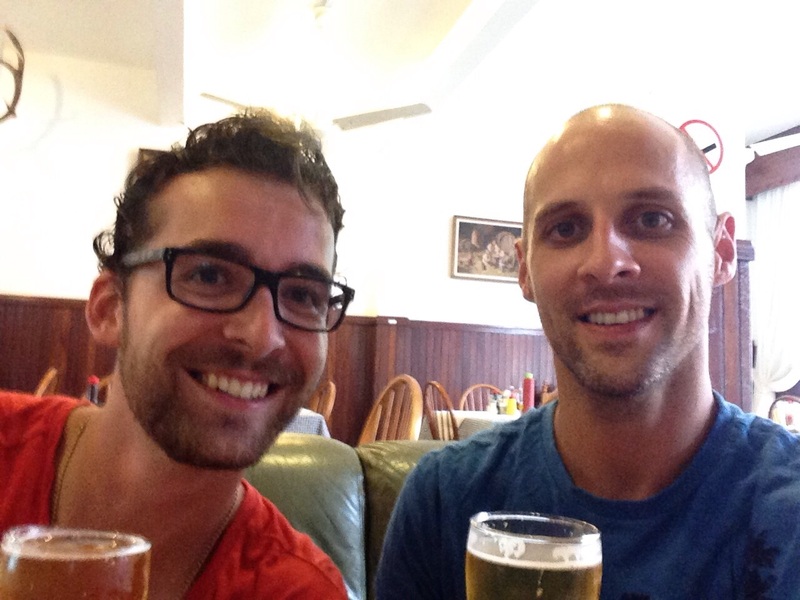 It was great to swap a few stories over a beer. Impromptu reunion in the most unlikely city. Sooner than I’d have liked, I had to cross the border. After some quickly resolved confusion over locating the border office, getting a bus to the centre and locating my hostel, I finally arrived. As shipping containers loomed I could finally relax – right after I trekked back into town to get some money for the hostel. 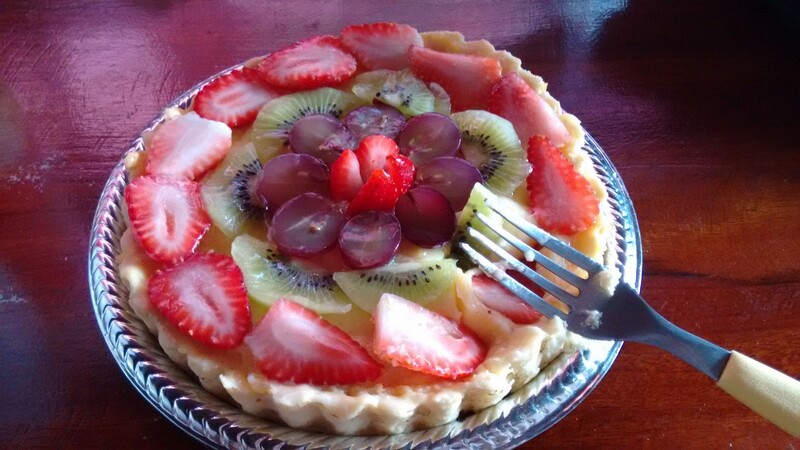 A Love Affair with Cake, Border Crossing, City Exploration, November 2015, Waterfalls. Bookmark.